The last two weeks, we have planted fruits and veggies in the garden, and we planted sunflowers that will come home mid-May. We also checked in with our oak tree in see how it is doing in the spring weather. We planted watermelon, kale, and radishes. The Fireflies hope to sample Kale and radishes before the end of school. The children enjoyed digging in the soil and hunting for worms as we palnted the seeds. We also planted sunflowers that the children will take home after they sprout. By the fall the sunflowers will be 5-7 feet tall so find a place in your yard to replant it, once it is too big for the original container. All the talk about seeds and growing reminded us of our remaining oak tree. Each child got a chance to measure and record how tall the tree has grown( 11 centimeters). At Circle Time, we collected items that were the same height of of the tree and compared our items. Our sunflower activities focused on science, measurement, and writing. When we planted our seeds we discussed that it would need soil, sun and water to grow. We noticed that some of the seeds looked different from each other and notices the different color flowers on the seed packet. Each child practiced writing letters as they guessed what color thier sunflowers would be. At cirle time, we discussed that out flowers would be "about as tall as Meaghan." Sixty inch measuring tapes were handed out and the children found items that were as long as or tall as the sunflowers will be. The rugs and one of the tables in our room were the right size and outside in the gazebo yard, the fence, bridge and gazebo were sunflower size as well. 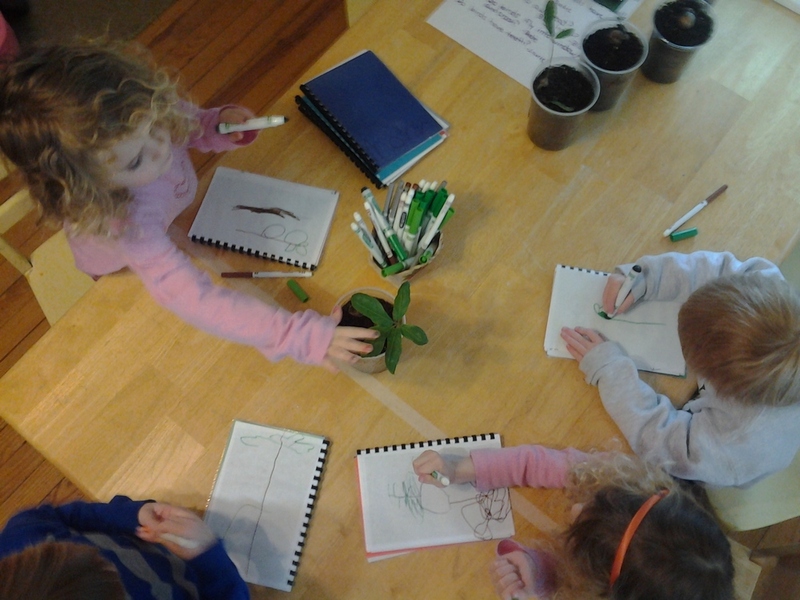 We also drew pictures of ourselves, the fullgrown sunflower and something that will be the same size as the sunflower. Our attempt to build bird nests. We learned birds are very clever creatures and have skills we don't posess. Can you find the real bird's nest? The MWF class observe our healthy tree and compared it to the other trees with brown spots on thier leaves. Each child drew a picture of the healthy tree and one of the sick trees.The five trees that had started to grow suffered a series of misfortunate events. The littlest sprout stopped growing and died. Three trees contracted a brown spot disease that looked to be fatal. Our love bird was fond off the trees and tried landing on them several times. We had one healthy tree, and then all of the trees were knocked over! We rescued the healthy tree and replanted it. After the spring thaw, our remaining tree will be put outside and hopefully it will hang on! our friend, Tweety, liked the liitle oasis of nature in our room. He knocked off two branches trying to land on the tree. Tweety, we still love you! This morning was sunny and beautiful and our Nest Zester was full. It took two weeks for both classes to cut enough yarn to fill the suet feeder. I made rulers out of large craft sticks and the children measured and snipped yarn pieces. Cutting yarn proved to be a difficult task but every child was ready for the challenge. We gathered on the steps of the porch to discuss what yard should we hang the Nest Zester and the class quickly decided the Gazebo Yard was the ideal place. We had to look for a tree that I could reach and after a couple of tries we found the trees by the Taxi Yard gate. Hopefully birds will notice the colorful yarn, fly over grab a piece and add a little zest to their nest! The Tuesday/Thursday class went on a bird walk this week. I wasn’t sure how successful we would be but as soon as we went outside the children had their eyes and ears ready to spot and hear birds. We saw a flock of geese by the pond beside our school, and then a hawk flew above our heads. “Caw Caw!" 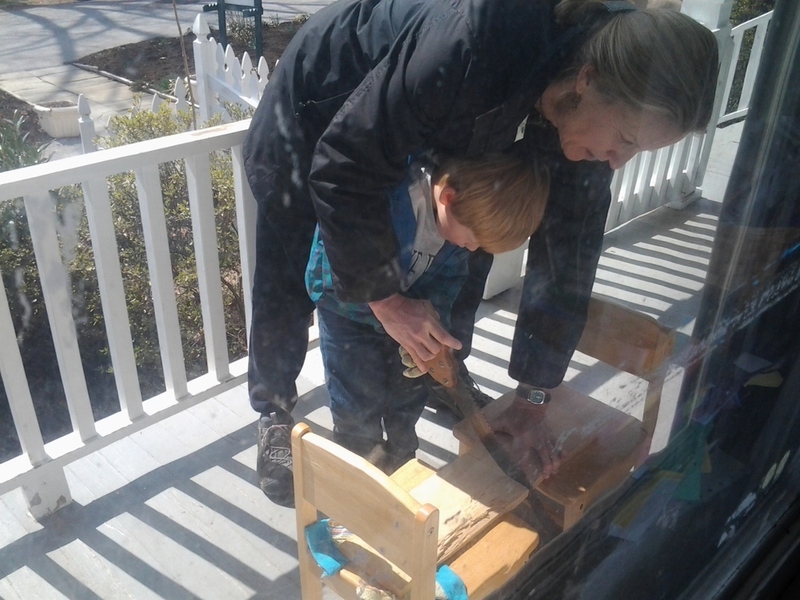 Sasha quickly declared, “I heard it!” and Drew identified the bird song was from a crow. We heard a another bird song but couldn’t see the bird, but Riley K. said the sound made a “Chickadeedeedee” sound. Suddenly, we heard a “Weegaaa, Weeegaaa, Weegaaa” and followed that sound to the Bicycle Yard. Under the pine trees, Aidan picked up pine needles and said, “Birds can use these!” and Riley K. agreed saying, “Yeah, in their nests!” Our most exciting discovery, was waiting under the pine trees, a beautiful scattering of yellow, black, and grey feathers! Luis pointed out, the different sizes of the feathers and we also noticed a second type of downy feather was lying on the ground as well. Each child collected one feather and I picked up the rest for later study in our classroom. As we were walking inside, Marcella joined the class late that day and didn’t have a feather and Riley P. promptly gave her feather to Marcella! Upon returning to the room, each child put their feather in a baggie to bring home. Don’t worry, Mathin, we saved one for you! At Circle Time, I read the book birdsongs and we talked about all the different sounds we heard on our walk. After Circle, each child came to the table to work with me one on one, to make a list of the Bird Songs from our walk. Each child remembered a sound from our walk and copied the letters to write the words: CAW, HONK, CHICKADEEDEEDEE, PIPIT, OR WEEEEGAAA. The Firefly children were extremely interested in this writing project and repeatedly asked for their turns. It gave them an opportunity to associate letters with their sounds, practice writing, forming the letters and proper pencil grip. Later this week I will introduce the word: Ornithologist: a zoologist who studies birds; Bird Watcher. I wonder which child will be up to the task of copying that big word! Last week we played a game called Zitternix. The children work together to keep the sticks steady as they remove one stick at a time from the structure. After the structure falls, the group counted the sticks they were able to remove. We tried to beat our previous record each time we played. The Fireflies love this game and have no idea that one of the reasons I like to put out this game is the children practice counting with one-to-one correspondence. The MWF class used every unit block in the room to build a road that stretched across the room. Every child at one point during play time added blocks to the road. Building the road involved using spatial relationships and reasoning skills as the children told each were the blocks should go . They built lego cars and the forest animals traveled on the road. When all the blocks were used up, I asked the children how many blocks did they think were in the road. I wrote down all their estimations and then we counted all the blocks. Then We compared our estimations to the actual number of blocks. Yesterday, I had the pipe cleaner box set out, so we could sort out the brown pipe cleaners for a tree project. 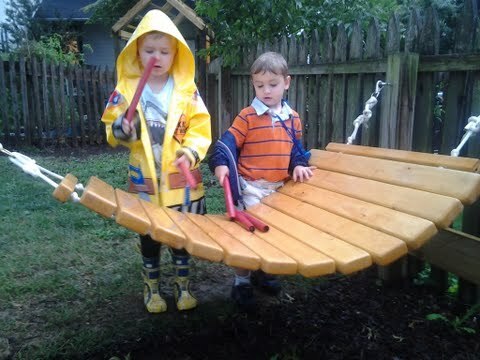 The children set out on their assigned task,and when they had sorted out the browns, they weren't quite done. Children made bouquets and graciously gave them Laurie and I. Drew started building a line, twisting the ends of pipe cleaners together. We started sorting out all the different colors and pretty soon every child in the class squeezed in around the box. Children sorted and moved on and came back to the project as they pleased. By the end of the activity, we had a very tidy box and Drew had a very long line. The pipe cleaner line was longer than our room, so we look it out in to the hallway. The Fireflies laid down next to the line and it was longer than six children! But what about buttons and fabric? The days preceding Winter Break we were making a special present for you for the holidays. I was tempted to keep them together as a group for art show, but alas they were destined for you! The Fireflies have been interested in the letters of their names. This week, we had a Letter Hunt in the room. At Circle Time, each child received an envelope with their name on it and had to find the letters in their name in the correct order. This last direction was hard to follow, if a child recognized a letter that was in their name but hadn’t they had found the proceeding letter they were not allowed to pick up the out of order letter. When a child found all their letters, they put their envelope on the rug and helped a friend find their letters. After the hunt was done and all the letters all accounted for, we gathered on the rug to spell out our names. This was a good opportunity to point out that names (and other words) start at the left . Having spelled our names, we played a letter game; I would announce a letter and if the letter was in a child’s name, they were to stand up. A visual cue was provided if necessary. The Letter Hunt was so popular that we held another hunt the next school day as soon as the children entered the Firefly Room! Fairville survived Hurricane Sandy, but many branches and sticks have fallen off the trees. This was a perfect opportunity for the children to learn about one of the Quaker testimonies. We gathered together beforehand, and I told the children about a big word…Stewardship. Mills, a serious branch collector. We collected the branches and put them in a pile. September was busy and my little Firefly Friends are adjusting to a new school year. We spent the first few weeks learning a new school routine. 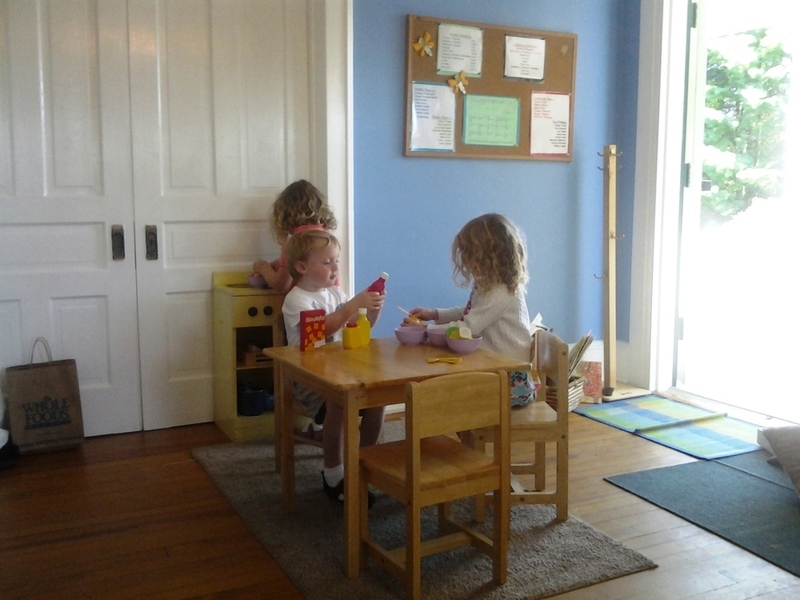 The children enjoyed several Circle Time games designed to learn each other’s names. The Name Challenge was the culmination; I asked the children to hide their eyes and I picked one child to hide behind a blanket, then the children could open their eyes and guess who was missing. The children loved this game and we quickly had to make the game harder by hiding two people at a time! We ended the game with silliness by hiding everyone under the blanket at the same time. The giggles and smiles as we all hid under the blanket brought a sense of unity within our class. September has also been about setting the stage for the rest of the year. The Tools of our Classroom has been a topic at circle time. Each tool has a job and a story to tell. 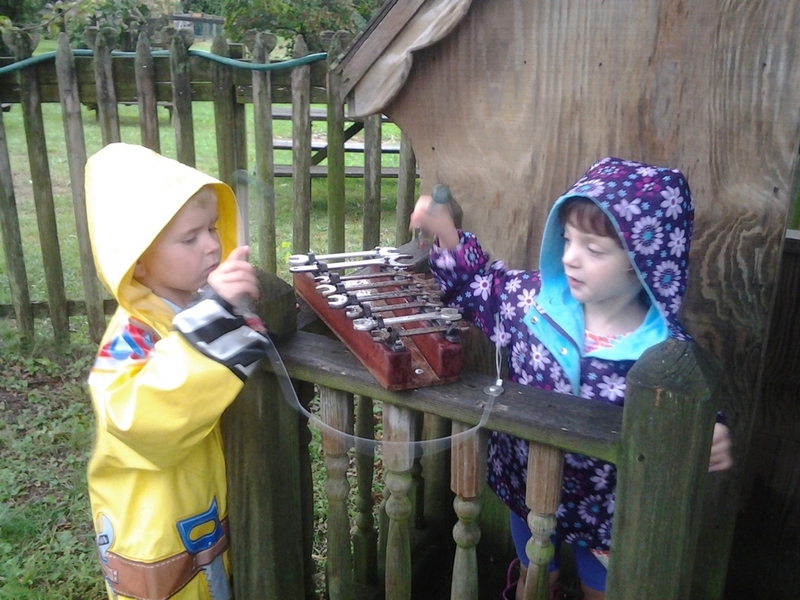 We learn or review how to use each tool and sing a little song to help us remember. We spend a lot of time in the beginning of the year with Tools of our Classroom to promote independence, build self confidence, and work on fine motor skills. As a result, the Fireflies respect and learn how to take care of our classroom materials. The Peace Garden is a new addition to Fairville this year. Teachers and children are both enjoying this new place to explore and learn that peace is more than being quiet or saying I’m sorry. Our introduction to the Peace Garden began with celebrating International Peace Day. The second week of school, we mixed cement, poured the cement into a mold and decorated stepping stones to be a part of the walkway that leads into the Peace Garden. Each class made a stepping stone and we held Meeting for Worship in the Peace Garden to share each classes’ creation. Since then the Fireflies visit the garden several times a week. Before we go in, we spend a few moments to relax; I ask the kids to raise their hands over their heads and breathe out as they bring their hands down to their sides. This simple action tells the children the Peace Garden is a special place and our bodies are calmer as we walk across the stepping stones. 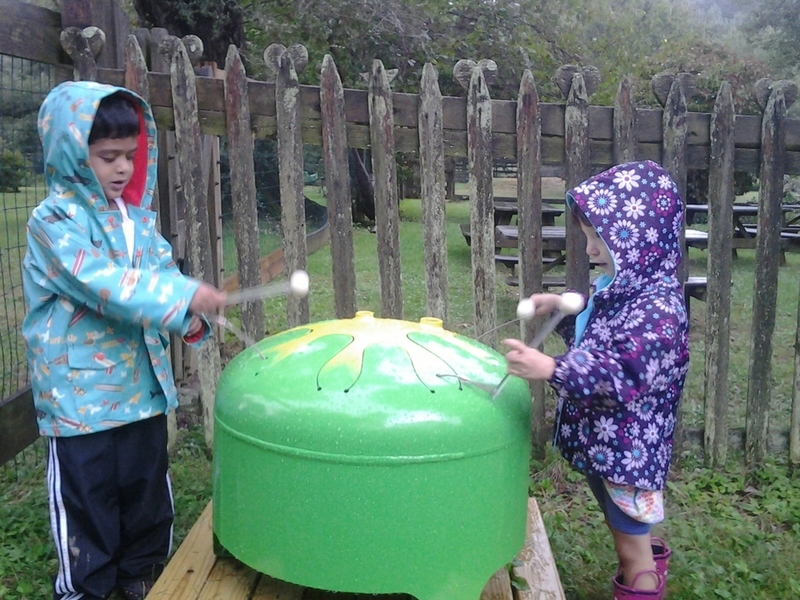 The children love the wooden amadinda, the wrench xylophone and the propane tank drum. New benches arrived for the children to relax on and the outdoor easel is popular as well. In the center of the garden are several discovery boxes, where the children can build, investigate and create with natural materials.